When Mackenzie was six months old, we established a bed time routine with her that includes reading a Bible story, talking about the story, and praying together. For the last few nights, we’ve been reading about Jesus’ death and resurrection. 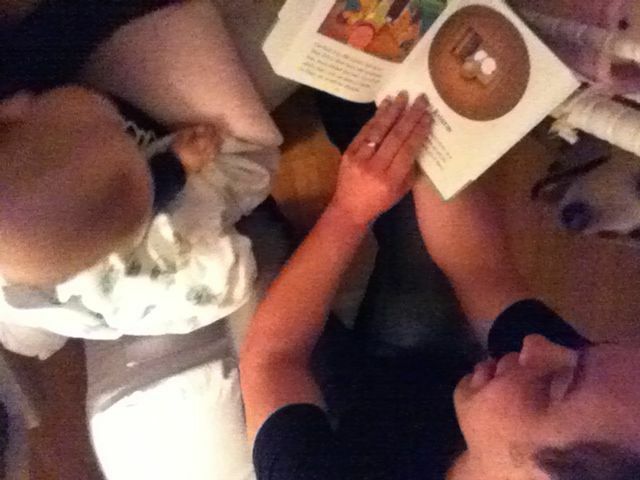 Baby Bible stories are written to be incredibly brief, but Chris and I have kind of enjoyed that – they are tiny, powerful reminders of the basics of our faith. When Christ was crucified, the disciples were sad, worried, and uncertain about the future. When He rose and visited them, they were filled with joy, and Jesus told them what heaven would be like. It’s so simple, and so true. I forget sometimes that God knows the next part of the story, and I can have joy and hope because of Him. I don’t have to fear the future because Jesus has gone before me. He both precedes and follows me, and He places his hand of blessing on my head (Psalm 139). He makes a wide path for me, and makes me sure-footed when otherwise I might be weak or afraid. He keeps me from slipping (Psalm 18). In my present and for eternity, I can trust my path to Him. Clearly I am talking to myself tonight. This post is probably more suited to my private journal than my public blog, but here it is. Here I am. I hope hearing from my heart somehow encourages you. We are considering some changes around here that honestly? scare me. I can’t see the future, and I’m afraid. I want to be like the woman in Proverbs 31, but I’m not there yet. But I can see open roads, wide paths, and open doorways. I’m taking one step after another, as they open up before me. I have no idea where this road will lead, but I know my God is with me. i love these types of posts. so encouraging and open. it is so great that we have Someone looking out for us, who truly knows us and shows us where to go. good luck with the scary.